I tacked up Wizard and rode him in the outdoor arena. He’s still lame. It’s subtle, but it’s there. It’s the right front, and it’s worse around turns. He’s not upset by it, actually, he rides really nicely. 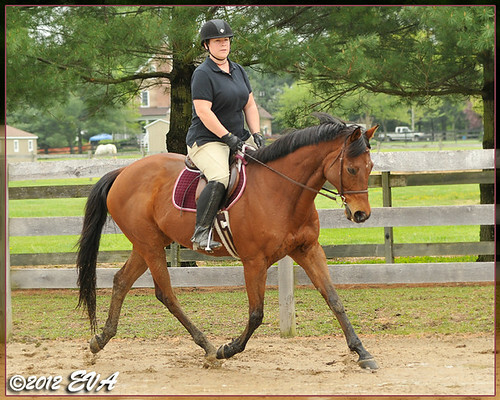 We just took a quick spin at a walk, trot, and canter, and Mom took pictures. He was willing, forward, and happy. He picked up both leads comfortably, and was happy to travel in the wet footing. No ear pinning or anything like that. I’m wondering if the pre-ride Maalox is helping neutralize the ulcers temporarily before rides. The farrier is due on Monday morning, and I’ll talk to him about putting pads on him and see if he has any ideas about the lameness. His quarantine period is almost over, and we’re going to start his UlcerGard treatment. He will be transitioning to 24/7 pasture, and not a moment too soon; he dropped weight from the move, and is cribbing as much as he did at the old barn. So in the meantime, I’ll just keep visiting him and pouring money into him.